The Diocese of Gaylord has several religious programs available for scouts (Boy Scouts, Girl Scouts and Venture Crews.) We have supported scouting for over fifteen years. Contact the Diocese of Gaylord for information on the religious programs that we offer for youth and how to begin. The Diocese of Gaylord provides a Diocesan Chaplain for our Diocesan Catholic Committee on Scouting. In the past, the Diocesan Chaplain has celebrated masses at summer camp at Cole Canoe Base, and when available attends Boy Scout Court of Honors. Every year, many parishes in the Diocese of Gaylord celebrate Scout Sunday to honor our boy and girl scouts. The level of participation in Scout Sunday depends on how active the scouting units are within a parish. 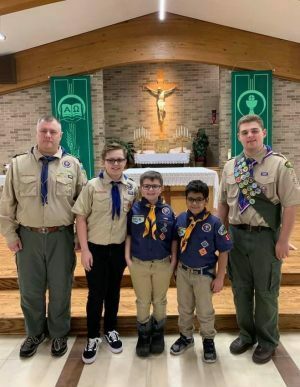 Some parishes invite the scouts to greet parishioners before mass begins, serve as Altar Servers, proclaim the readings if qualified, bring up the gifts, usher or pass out bulletins. For Boy Scouts, Scout Sunday is on or around February 8 which is the Anniversary of Scouting which began in 1910. This is a great time to award Religious Awards, such as the Light of Christ, Parvuli Dei, Ad Altare Dei, or Pope Pious XI medals. This year, Scout Sunday falls on February 7. For Girl Scouts, Scout Sunday is March 6. Girl Scout Week is celebrated each March, starting with Girl Scout Sunday and ending with Girl Scout Sabbath on a Saturday, and it always includes Girl Scouts’ Birthday, March 12. If you see a scout dressed in uniform on one of those days, be sure to thank him or her for their service in scouting. How do we keep our volunteers? Recognize them for their hard work and achievements! The National Catholic Committee on Scouting is a great resource for awards for both scouts and adult leaders.